Last year one of the better Windows laptops I encountered, at least based on the core appearance and design, was the Dell XPS 15 (Ivy Bridge Edition). It was basically Dell's third attempt at making a MacBook Pro (more or less) – the first two attempts being the Arrandale XPS 15 (with the Sandy Bridge model using the same design), then there was the XPS 15z that used dual-core Sandy Bridge in a slimmer form factor, and then the retooled XPS 15. Today we have the fourth generation XPS 15, which has taken many of the design elements of the IVB XPS 15 but hopefully fixes the cooling/throttling, adds a Haswell CPU and an updated 700M NVIDIA GPU, ditches the optical drive, and on the higher-end SKUs you get an ultra-high resolution 3200x1800 display. The display is actually both good and bad, but I'll get to that later. Let's start with the core specifications for the high-end model, which is what I received for review. The display is actually one of the few areas where Dell comes out ahead, however. In most other areas, the laptops are either equal or Apple maintains their lead. For example, Apple is now using PCIe based SSDs while Dell is using a Samsung SM841 SSD mSATA drive – it’s not that the SM841 is slow, but the PCIe SSDs are certainly faster. For the CPU, Apple has elected to use Intel's latest Crystalwell chips with Iris Pro Graphics (i7-4750HQ and i7-4850HQ) while Dell is opting for the 37W quad-core i7-4702HQ. It's not a huge difference in performance – the maximum CPU clock is 3.5GHz on the 4850HQ compared to 3.2GHz on the 4702HQ and 4750HQ – but Apple still comes out ahead thanks to the “L4 cache” (eDRAM). On the GPU front, both systems use NVIDIA's GT 750M GDDR5 chip, so the difference in iGPU performance is largely superfluous. Interestingly, it appears the main reason for the difference in CPUs (other than Dell not being interested in Crystalwell) is TDP, and in fact the base clock of the 4702HQ is actually slightly higher than the base clock of the 4750HQ. Worth mention is that there are three different models of the new XPS 15 available right now. The base model XPS 15 comes with a 1920x1080 touchscreen display (it’s not clear if this is a TN panel or not), 500GB HDD with 32GB SSD cache, dual-core i5-4200H CPU, 8GB RAM, integrated HD 4400 Graphics, and a 61Wh battery for $1500 (or a 3-year warranty for $1750). Stepping up to the $1950 XPS 15 will get you the quad-core i7-4702HQ CPU, 3200x1800 PPS (similar to IPS) touchscreen, 16GB RAM, GT 750M GDDR5 GPU, a 1TB HDD with 32GB SSD cache, and a 61Wh battery. And then there's the big kahuna that we're reviewing, which is mostly the same as the $1950 model but it dumps HDD storage completely in favor of a 512GB mSATA SSD and adds a larger 91Wh battery in place of the 2.5” drive. $400 extra for a 512GB Samsung SM841 is actually a pretty reasonable expense, considering retail pricing on that SSD is typically well over $500, making the added battery capacity a bonus. Of course Dell isn’t paying retail prices, and drives like the Crucial M500 480GB mSATA can be had for $320 online, but even then the $400 upgrade price is still reasonable. The components aren't the only change with this model. The design language of the latest XPS 12 and XPS 13 carries over now as well, with carbon fiber being used on the bottom casing of the chassis. Perhaps more noteworthy is that Dell has ditched the optical drive this time around, and on the highest end model they also skip out on conventional storage. Both changes make room for additional battery capacity, where the model we're reviewing comes with a 91Wh battery. Dell also manages to stuff all of these updates into a thinner and lighter chassis – the new model we have weighs 4.44 lbs. (2.01kg) while the previous generation weighed 5.79 lbs. (2.6kg), and this generation is 0.7” (18mm) thick compared to 0.91” (23.2mm) previously. Not surprisingly, the host of changes listed above makes for a much more interesting laptop, but one that can end up costing a fair amount of money. Given that only the top model sports pure SSD storage, that's the one we need to compare with Apple's rMBP 15, and it mostly ends up a wash. You can get the Dell for $2300, as mentioned already. The rMBP 15 with 512GB SSD on the other hand will set you back $2600. Apple gives you a faster SSD (PCIe based), a faster CPU (i7-4850HQ), and Thunderbolt 2, which makes the extra $300 acceptable. (Other options for right around the same price are available, for example this one gets the i7-4950HQ CPU but uses Iris Pro Graphics and only comes with 8GB RAM.) Dell's model has a larger battery (but likely less battery life if we compare Windows 8.1 with OS X Mavericks), a touchscreen, and a higher resolution display. Ultimately, it's likely going to be more a question of whether you're interested in running OS X or Windows 8.1. I do have to say that I also miss the ability to custom configure Dell’s laptops, and perhaps that’s just the way things will be with systems like this that target style more than pure performance. I’d love to have the option to configure the storage, display, CPU, RAM, battery, and GPU options rather than choosing between one of three pre-configured models but that’s just not in the cards right now. Anyway, with the overview of the core components out of the way, let’s find out how the XPS 15 performs, what's it like using a high-DPI display in Windows 8.1, and how the laptop fares in everyday use. 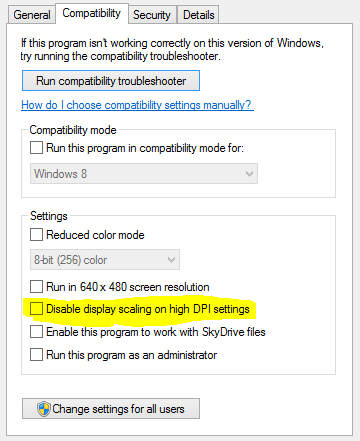 "and perhaps give the user the option to enable/disable the scaling if it causes problems"